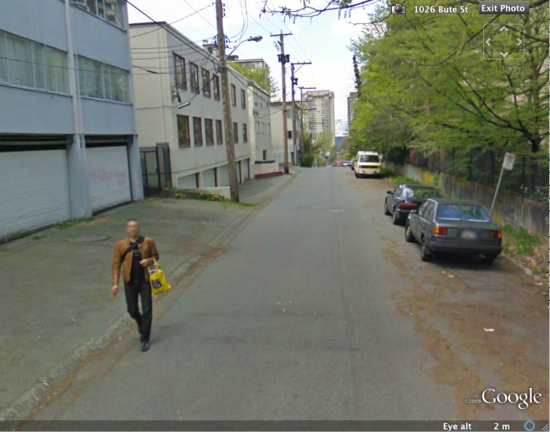 Check it out, my image was captured in Google’s street view. Don’t tell anyone at the City, but I was out postering in the West End for a West End Residents Association event by stapling posters to Hydro poles. You can see my red staple gun. 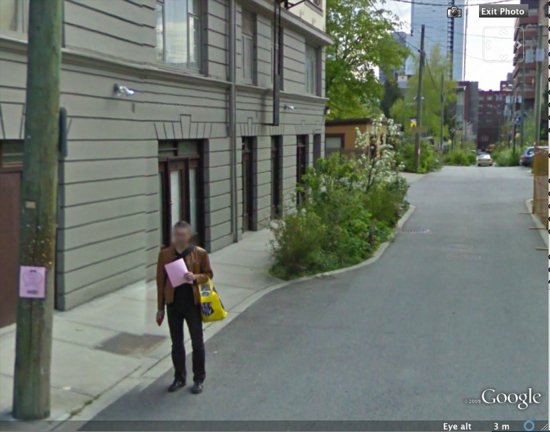 Good thing Google did not actually catch me in the act. At the September 22 Council meeting Councillor Suzanne Anton submitted a motion on notice about the independence of the Vancouver Park Board. Originally Councilor Anton had intended to move the motion at the September 22 meeting, but for some reason she with drew the motion and put it on notice. In preparation for the motion the City Manager, Dr. Penny Ballem, asked the City legal department to produce a legal opinion on what the jurisdiction of the City Manager was in regard to hiring of the General Manager of the Park Board. 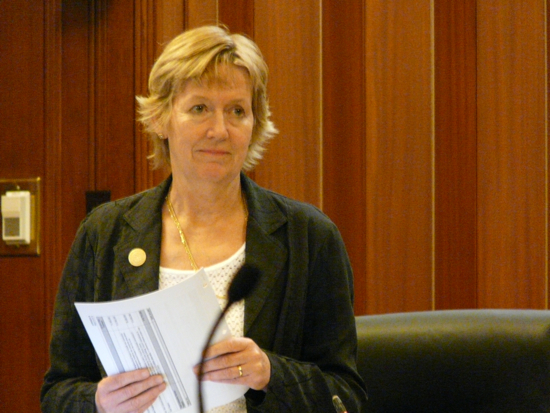 Councillor Anton’s motion was motivated by the sudden letter of retirement by Susan Mundick, the General Manager of Vancouver Park Board and the surrounding gab in the blogosphere by the leaked email from the City Manager to the Susan Mundick regarding her plan to pick her own replacement. The City Manager considered the plan of the General Manager to choose her replacement as “inappropriate”. The legal opinion that the City Manager asked to be prepared for the motion originally was not officially given to the public, but was leaked to a member of the media. state of VancouverI guess that would put it in the public domain now. Now on October 6 Councillor Anton’s Motion is on the city Council agenda. The motion was motivated by a leaked email and much of speculation around the motion was based on a leaked document. The question going into today’s Council meeting was will any of the other Councilors second the motion given that the question that the motion seeks to clarify have been answered by the legal opinion? As it turn out the there was no Councillor to seconded the motion and as the Mayor stated: “ that motion is behind us” and it died on the docket. During the 2010 Winter games Pivot Legal and the British Columbia Civil Liberties Association (BCCLA) is planning on having trained “Observers” to monitor and document and infringements of civil liberties of citizen by the the 2010 Vancouver Integrated Security Unit (V2010 ISU). On October the 1st 2009 Harm Reduction Victoria (HRV) hosted a forum entitled: “Needle exchanges and supervised consumption services can contribute to safer neighbourhoods”. 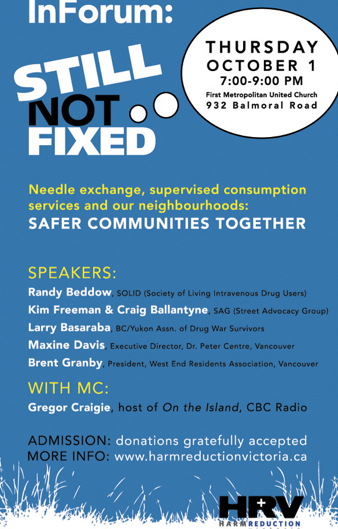 The forum was a panel discussion comprised of injection drug users, needle exchange activist, the Executive Director of the Dr. Peter Centre (DPC) and myself as a rep from the West End to speak to how the DPC functions in a densely populated residential neighbourhood. HRV is advocating for a “fixed” needle exchange facility to replace the one that was closed in May 2008 and to replace the mobile needle exchanges that are currently deployed. Intravenous Drug Users (SOLID) died of unknown causes. At the beginning of the forum his friends paid tribute to him. It was a poignant moment that made the importance of the evening all the more apparent. Injection drug users lives are high risk. As my partner who is general internist at St. Paul Hospital and has many injection drug users as patients says: “There is nothing glamorous about drug users, it’s a hard life”. The Dr. Peter Centre (DPC) is located on the corner of the Mole Hill Community Housing block. The block of renovated heritage houses consists of 178 units and is home to 300 tenants with mixed income levels. In the alley between the heritage homes is a community garden with 70 plots. On Comox St. on the Western edge of the block of Mole Hill is a Farmers Market every Saturday morning in the summer where residents from all over the West End shop for organic products. Further West on Comox St. is the YMCA Mole Hill Day Care. Across from Comox St. is Nelson Park with an elementary school, dogpark, playground for kids, community garden plots and just places to sit and relax. Situated in a densely populate residential neighbourhood, the Dr. Peter Centre is a community health service provides that is located in a vibrant community. Participants of the DPC arrive in the West End from all over the city of Vancouver. The Centre has two streams of care: One for inpatient residents and another for outpatients. The participants of the day health program come to the DPC for food, medical services and programs. As part of the medical health services that the Dr. Peter Centre provide there is a needle exchange and a safe consumption room attended by a nurse. The Right to the City: Impact on the Communities Coalition’s forum on civil liberties and the Olympics. The question for Vancouver citizens running up to the Olympics and afterwards is whether or not the games have had a net benefit on the City. This was the debate that the plebiscite tested; we were asked to decide if the games were going to be in the best interest of the citizens of Vancouver? There are many claims to what the legacy of the games will be. On Monday September 28, 2009 the Impact on the Communities Coalition(IOCC) hosted a forum on civil liberties and the 2010 winter games at the SFU Harbour Centre. The forum consisted of a panel representing a broad range of what was being coined as “Olympic skeptics”. The panel was moderated by the Chair of IOCC, Am Johal. Stefanie Ratjan, a board member of IOCC, was the first to present and spoke to David Harvey’s notion about the right to think of change in the city. David Harvey’s essay, “The right to the city” was basis of the title of the forum. David Eby, the executive director of the British Columbia Civil Liberties Association (BCCCLA), was also on the panel. Mr. Eby spoke about the credibility gap between what authorities responsible for the games are saying about how there will be no impact on civil liberties and the raft of new City of Vancouver Bylaws that were passed at Council last June as well as the contracts that the host city entered into with the International Olympic committee. The diversity of opinions on the panel ranged from speakers that were critiquing the discourse of the games to folks that were actively proposing that the games should be boycotted. Harsh Walia spoke to the contradictions of the games in regard to the vast amounts of money that are being spent on security to protect citizens from terror threats which in itself could be thought of as a form of terrorism of the state on its population. She spoke to the scope of the security of the games and the impacts on city as result. David Dennis, President elect, United Native Nations, spoke about the effects of power on native people and the resulting loss of language and spirituality. Mr. Dennis also noted that Bud Mercer was the RCMP officer responsible for the Oylmpics Intergrated Security team and had been involve in the Gustafsen Lake police incident. Mr. Dennis also spoke of native youths perception of games and some of their concerns. Alissa Westergard-Thorpe, Olympic Resistance Network, recounted events of the OPEC conference in Vancouver in 1997 as a pattern of security actions, which are the results of corporate and state interests determining citizens civil liberties. Matt spoke about some of the underlying logic of our notions of safety and security. Finally Jeff Derksen, an critical theory professor at SFU, poet and co-collaborator of the Flying University and author of Transnational Muscle Cars Jeff’s bookrounded out the evening by expanding on some David Harvey’s themes. Jeff spoke to the notion of how space in a city is a process. Public space is made by the activities that make it and conversely the use of security is a way of making space private. The last words goes to Am Johal from his introduction to the event. Am made the point that there is a huge issue of balance in regard to how much media the positive messages around the Olympics have had. Olympic skeptics have been have been positioned by VANOC and its boosters as being too negative and one-sided in their discourse around the games. Am makes that point that in comparison to the resources that are being put into security and communications for the games,the capacity of the groups participating in the forum on the panel was quite limited. Given the uneven communication capacity it is important that citizens of Vancouver have a range of critical perspectives on the games, which activists on the panel represent. David Dennis-President elect, United Native Nations, spoke about the affects of power on native people and the resulting loss of language and spirituality. David Eby, the executive director of the British Columbia Civil Liberties Association (BCCCLA). Mr. Eby spoke about the credibility gap between what authorities responsible for the games are saying about how there will be no impact on civil liberties and the raft of new City of Vancouver By-laws that were passed at Council last June and also that the contracts that the host city enter into with the International Olympic Committee.